Goal: Create a platform that aides service professionals to purchase and access leads easily. Service professionals were not picking up many home service job requests coming through Angie’s List as they found it challenging to keep track of them. Our team set out to create a unified platform to help the service professionals unlock service requests, contact the customer and access the job details at any time. Today, a lot of service pros receive job request leads from Angie's List customers in their e-mail. Since these pros are on the road most of the day, some of the leads are already taken up by other competing pros by the time they get back to each one of it. They also have a hard time going through each of these requests in their inbox and purchasing the leads as there is no central hub to look at all the leads requiring their attention. Our team started out by interviewing stakeholders to understand the background and collaborated on a brief to keep everyone on the same page with the problem. We also maintained a workbook on Jira to post updates around prototypes and findings from testing. After some exploration, we decided to test 3 different ideas with 10 service professionals to understand their needs better. Through testing we learned that service pros liked to do an implicit comparison of leads (based on zip code, type of job..) and the expandable list concept worked will for this purpose. 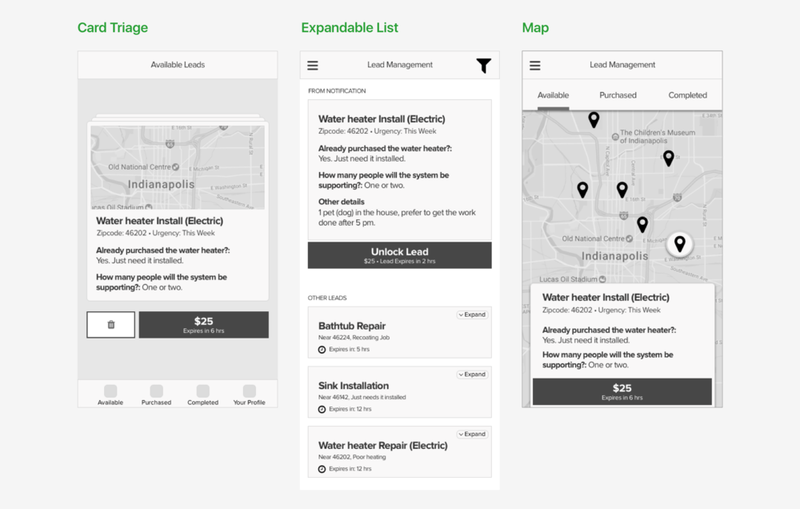 We decided to iterate further on the expandable list concept. Based on the problems identified in the current experience and from talking to the service professionals, we were able to identify a few opportunities and focus our design on that. We created a responsive web version that brought a cohesive lead management experience to the business center – an Angie's List platform that service professionals currently use. I worked closely with the PM to lay out the user flows in terms of the releases. 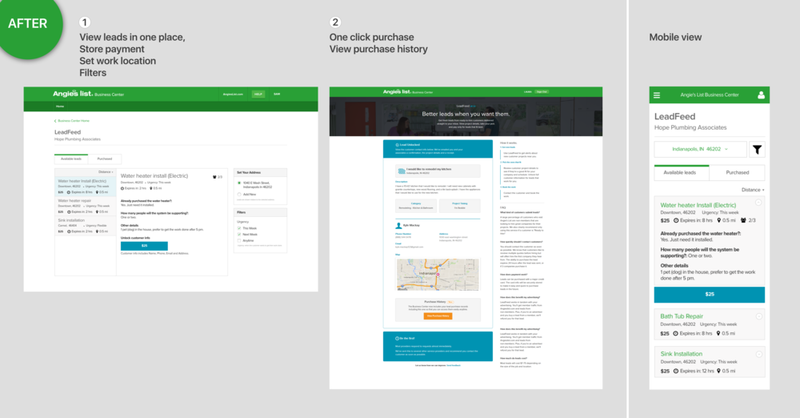 Based on our learnings from research, we built a lead inbox for pros that helped them view all the leads in one place and provided key information that helped them make a decision on which leads were a valuable purchase. Improved purchase rate – while the average number of purchases per lead was 1, our business aimed to get at least 2 pros to purchase every lead that came from home owners. Better turnaround time for home owners putting in service requests – by adding an expiry badge to the leads, we aimed to get pros to act on a lead within 24 hrs of its submission.